20 months TSW: Hang in there TSW Warriors! This video is very significant for us because it remind us how hard the TSW process was; but at the end all the effort seemed to have been worth it! I have never been a fan of any Disney princess in my life. In fact, I have always believed that they are not a good reference for little girls, only an example of an excellent marketing campaign. However, since last year, I changed my mind. Catherine's self esteem improved since she watched the movie Cinderella. The process of TSW is hard, not only for the withdrawal symptoms, but the low self esteem. Before watching the movie, she was very shy, she looked down every time people were staring at her or tried to hide her face from them. It was frustrating as a mother to see that scene every time we were in the park or in the supermarket. After watching the movie, she started dreaming. She believed she was a princess, and she became more confident. Coincidentally, during this time she got better from her skin. 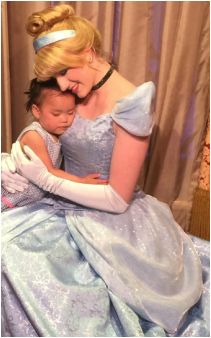 Last week, Catherine met Cinderella at Disneyland, she was so excited to meet her in person that she hugged her for a long time. For that reason, I'm not a princess hater anymore. I'm truly thankful with Cinderella for making my daughter believe that dreams come true. "Have faith in your dreams and someday, your rainbow will come smiling thru. No matter how your heart is grieving, If you keep on believing, the dream that you wish will come true"
This video summarizes Catherine's TSW journey during 17 months. Everyone's journey is different and some people have better luck than us. But at the end all the sacrifice is worth it. Thank you for all the people who have been praying for our daughter. Catherine had a very mild flare up after my last post, but a week later her skin was almost perfect. I said "almost" because her arms have been very dry and scaly like always. Regarding food, we didn't introduce anything new; I only made different recipes with the same options. For example, zucchini boats filled with ground turkey with vegetables, corn tortillas with homemade refried beans and chicken, egg & gluten free pretzels, and chicken nuggets with tapioca flour. At night, I can't complain because she sleeps better and therefore, we do too. Our life has changed, we are doing projects that we postponed a year ago and going out every weekend like any other family. 15 months TSW: A Hopeful Month! Great improvements! Every day, Catherine is getting better and better. Now, she doesn't use gauzes anymore!. However, she is still very itchy, her skin is dry and scaly, and mild flare-ups occur every now and then. The good thing is that now, flare-ups only affect areas that she hasn't improved. Regarding her daily routine, we bath her twice a week, her diet is based on the results of the allergy tests (IGG, IGE, skin prick test), and we applied a homemade cream and vaseline twice a day. We give her Zyrtec or Benadryl at night because she always has problems to sleep. At least, It helps her for a couple of hours. We are going to continue with this routine until she clears up completely. This was a month of mixed feelings. Overall, Catherine looks great, her face is improving and her body is still clear; but unfortunately, she has been VERY itchy. At night, she wakes up two to three times and sometimes, she screams because she can't stand the itch. As parents of a 14 month TSW sufferer, we feel exahusted. Our nerves are out of control and our patience is gone. We should be very happy for Catherine's improvements but we are extremely tired. We have been sick the past month. I have been reading a lot about resiliency to cope with this experience. 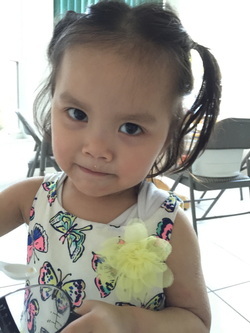 In two weeks, we are traveling to El Salvador; we feel paranoid because the last two years we had bad experiences regarding Catherine's condition. Hopefully, she will be better this time. Catherine's skin is slowly healing. Finally, her face is on its way to clearing up. She has been on a restricted diet for about 8 weeks based on the IGG food intolerance test results. It is a long list of restricted foods, but the elimination is for a limited time only. Regarding moisturizers, we have been applying a homemade cream made with zinc and mupiricin when needed. Even though Catherine is improving, she is still very itchy. At night, she wakes up 3-4 times. We have tried antihistamines, cold rags, and chamomile tea to relieve the itching, but nothing seems to work. On the other hand, we are trying to expand and diversify her diet because her menu is almost limited to soups. We feel happy for the great improvement, Catherine looks happier than ever. Her torso looks wonderful like if she were eczema free. It was a very tough month. 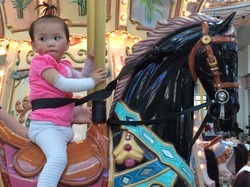 I haven't been able to write up a post because Catherine has been itchy most of the time. I knew that a flare up was coming, but I didn't think it would be so bad. Now, she has big red patches in her cheeks, armpits and chin again. I had so high expectations regarding Catherine's recovery on this month that going through another flare up really upset me. 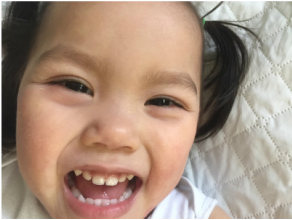 Our theory regarding this new flare up is that she might be experiencing teething symptoms. Teething can be stressful and this can triggers eczema. We have noticed that whenever she is tired, her skin starts to become itchy. This discomfort intensifies before every nap and while she is sleeping. Therefore, every night is a nightmare, Catherine's sleep is interrupted several times due to the itching. We try to make turns with my husband to avoid that she scratches so bad until she bleeds, but at this point we feel so sleep deprived that sometimes we fall asleep with her and we are not able to stop the itch fests. Anti-scratch sleeves don't work for her anymore because now that she is bigger and stronger, she turns her body against the pillow to rub her cheeks fiercely. Since she stopped breastfeeding, she has been obsessed with food. She has been eating chicken and beef stock with vegetables, turkey patties, green lentils, white rice and quinoa. Garbanzo pancake and banana bread (dairy and egg free) for breakfast; also apples, pears and cantaloupe. Additionally, rice milk and homemade coconut milk. For snacks, roasted edamame, cauliflower, fruit popsicles and Enjoy Life Sugar Crisp cookies. In summary, I can conclude that TSW progress is not linear. Last month, I had the good feeling like we were near the end; this month, I feel like giving up. Definitely, I will need an extra dose of patience for the upcoming month. After months of tranquility, yesterday was a really bad day. Another bloody episode that undermined Catherine's progress. I left her unattended for 5 minutes, while I was washing the dishes, and when I found her, she was sitting in the floor silently clawing her nails all over her face. She was bleeding so bad that I could barely see her eyes. Instead of getting mad, my reaction was to cry, cry so loud like a baby; she was in shock, I picked her and I took her to the bathroom; while I was cleaning her face, she said: "I'm sorry". I felt devastated, like the worst caregiver ever. Hopefully, she can heal faster from this. It was a good month. Finally, our first road trip since we started the withdrawal process. A couple of months ago, it was impossible to drive for more than 30 minutes because she felt constantly itchy. Therefore, driving for four hours without complaining was a big milestone. Catherine had a blast in Sarasota despite the bad weather conditions: hot and humid with tons of mosquitoes. She only complained of being itchy when we were on our way to the hotel and before getting to sleep. Catherine has red patches in both arms, torso, armpits and at the top of her feet. She wakes up constantly at night rubbing her face. Now, she hates to use the anti-scratch sleeves, so we have to wait until she is sleeping to put them on, but sometimes, we are so tired that we forget; so, she scratches so bad that makes her sensitive areas bleed. In the last months, we have seen a link between Catherine's behavior and scratching. Every time she is sleepy, asleep, hungry or bored she feels really itchy. For that reason, we are looking for alternatives to break the itch-scratch habit. Since she stopped nursing, her appetite increased. Her diet is limited to chicken stock with vegetables, turkey patties and snacks like oven roasted cauliflower, kale and soybeans. She eats a popsicle made from fresh apples and carrots almost every day. She also eats white rice or quinoa in every meal. In summary, it was a great month! We are now able to do so many things that we previously couldn't do. Going for vacations was a good way to revitalize us. We enjoyed as a family like we used to. Finally a turn for the better. Catherine has made a lot of progress in healing this month. The oozing from her left cheek stopped. Her face looks like it wants to clear up. There are a lot of challenges ahead, but we are very grateful for every little bit of improvement we see. Her torso is still covered with red spots. Her legs are very dry and scaly and her left wrist is still swollen. At night, she rubs her face constantly and she doesn't get back to sleep until she nurses. I have noticed a pattern that she feels itchy when she feels bored, hungry or sleepy. She has been doing a modified GAPS Diet. She consumes broth every day, probiotic once a week, and cod liver oil as well. She eats cantaloupe, oven-roasted cauliflower, edamame, kale and chickpeas as snacks. According to the GAPS Diet, she should avoid most fruits and legumes from her diet. However, Catherine seems to tolerate well these foods. Additionally, in this month, we eliminated red meat and rice. Catherine has benefited from MW. Her skin is getting stronger. Now, she is not using any cream, oil or soap in her body. I encourage other parents to try this method and see the difference. I feel relief. Finally we are getting results! She is no longer taking antihistamine, antibiotics or applying any kind of topical steroid cream. Another tough month. She caught a cold and had a severe flare up. Her left cheek was oozing for several days. I thought this would be a good month because we had family at home, but it resulted the opposite. Stress played a big role. 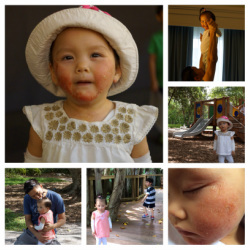 Since Catherine developed her skin condition and we started this process, we haven't been so strict in daily routines and discipline. Now that we have family with us, it has been difficult to keep rules. We have been dealing with meltdowns and temper tantrums from my eldest son that makes Catherine feel scared and uncomfortable. Breastfeeding issue. I've been so stressed out lately that I'm sure my breast milk has affected my daughter's eczema. I've been trying to wean off the breast several times, but every time I do it, she gets distressed. Every time she feels anxious, she scratches her body, face and legs. Now, instead of putting off feeds, she is asking more often. Unfortunately, nursing is the only thing that calms her down. Changing habits. 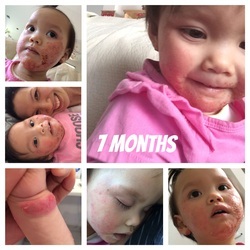 Making small changes in routine also affect Catherine's eczema big time. In this month, we did a lot of things differently. For example, we used household cleaning products containing Sodium Lauryl Sulfate, I changed part of my diet and we didn't separate Catherine's dishes, utensils and pots to avoid cross-contamination of foods. Weakened immune system. Illness, such as cold, always makes Catherine's eczema worse. Every time she gets a cold, there is a severe flare up that lasts up to two weeks. Thankfully, this time we didn't have to use the nebulizer, the cold went away on its own. Even though it was a tough month, we had a really good time with family. Another positive thing is that she is not taking any medication. No Bactroban, no antibiotics, no antihistamines. We haven't been in a doctor's office since last October when we started the TSW process. We are only giving her supplements (Probiotic, Cod Liver Oil and Vitamin D). Since we stopped using moisturizer her legs improved a lot, now she can stay naked without scratching her legs. A week ago, a clear yellow liquid was oozing out on Catherine's left cheek. This time, I was afraid to assumed that it was just part of the withdrawal process because of the yellowish color. I posted my concern on a TSW forum, and many of the responses were to let it dry. Someone said that I should be worried only if the discharge was opaque yellow. Others recommended me to err in the side of caution and take her to the doctor. Since she didn't have fever or any other symptom we didn't take her to the doctor and we didn't put anything on it. Three days later, the oozing dried up by itself. Catherine is now more aware about her skin condition. 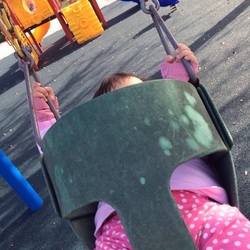 Yesterday, while we were at the playground, someone stared at her for a really long time. She immediately turned her face down and hid it in the swing. I was so mad that I said loudly, 'Catherine, lift your face. You are beautiful and you dont have anything to be ashamed of. It is only an allergy.' She changed her expression and smiled me back. 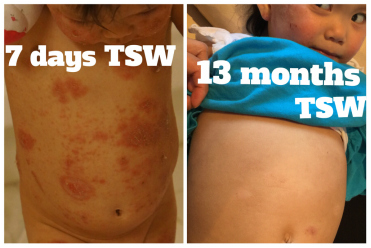 I won't let this skin condition affects my daughter's self esteem. For that reason, every time I have the opportunity, I tell her that she is beautiful. Catherine passed the 5th month milestone and now she is officially in the 6th month. So far, we have seen slow and steady progress with some drawbacks. Her legs, arms and torso are showing improvements. Right now the major problem area is her face. In this month, we noticed that flare ups now occur weeks apart and some red spots are finally fading. 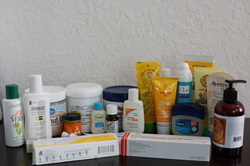 We are no longer using antihistamine and we are tapering off moisturizers. Recent evidence shows that moisturizer withdrawal is essential for TSW recovery . Time flies! I hope we can see the light at the end of the tunnel soon.